Got in this picture of Loch Kinord but confess I don't know who sent it. I replied to the email to see if the person had permission to let me use it but the email bounced back. As I don't have any other pictures of this area I've taken the chance that it's ok to use. 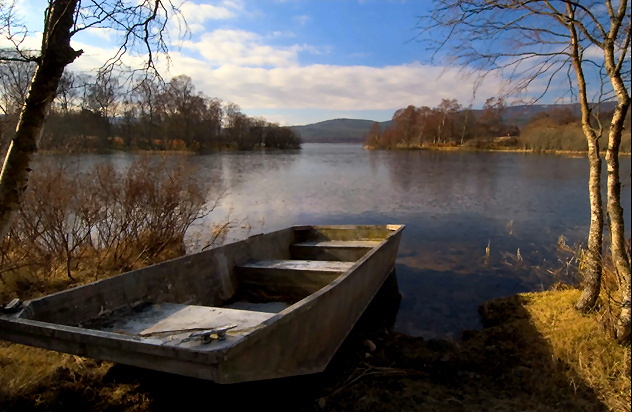 It may be necessary to state, for the sake of those who are strangers on Deeside, that Loch Kinnord, with the history of which the following pages are concerned, is situated in the valley of the Dee, five miles beyond Aboyne, near the Dinnet Station of the Deeside Railway. In order to make the chapter on the geology of the district as brief as possible, places are indicated by simple reference to their local names, as, in the opinion of the author, the shortest and surest direction that could be given to a stranger who might wish to examine them minutely. For a more detailed description of the archaeology of the district than could be given here, the antiquarian reader is referred to a paper on the subject read before the Society of Antiquaries, at their meeting in June, 1875, and to the work of Miss MacLaggan on the "Hill Forts and Stone Circles of Scotland." First among many friends from whom the author has received aid in the preparation of this little work, his warmest thanks are due to the Marquis of Huntly, but for whose kind and generous assistance it would not have appeared at the present time, nor at all in its present form. From the late lamented Dr. John Stuart—to whose memory the author owes a grateful tear— he obtained much valuable information and encouragement. An acknowledgment of obligation is also due to Andrew Jervise, Esq., whose extensive stores of information on archaeological subjects have been freely drawn upon. To Wm. Alexander, Esq., of the Free Press, for his great kindness in revising the proof, and thus much facilitating the progress of the work through the press; and to Mr. Bettie, Aberdeen, and Mr. Douglas, the publisher, for much valuable advice, the author has also to express his thanks. Chapter IV. Pre-Historic Period, to 1000 A.D.
Chapter VI. Historic Period, to 1400 A.D.
Chapter VII. Historic Period, to 1630 A.D.
Chapter VIII. Civil War, to 1645 A.D.
Chapter IX. Civil War, to 1647 A.D.